The King is dead. His daughter, untested and alone, now wears the Steel Crown. And a vast horde is steadily carving a bloody road south, hell-bent on razing Steelhaven to the ground...or the city will fall. "Many more deaths." is how this second book in the Steelhaven series ends, and how appropriate for a book that makes you crave to find out more about it's excellent cast of characters. 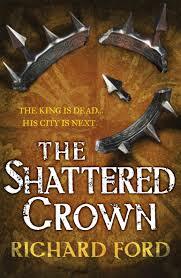 This is one of the best books I have read this year, and one of the best in the grimdark genre. The author accomplishes more in 400 pages than many do in twice as many. Richard Ford has become one of my favorite authors with this book. It is cleanly written, no unnecessary details, everything moves the stories or ads something to the character which helps the reader to know them better. This book starts off great as opposed to the first one, Herald of the Storm, which took about 100 pages to take off and really hook me. From the get go in this book I was hooked, flying through, neglecting other much better known books, and when I was reading those, I thought about this book and the characters I loved, which were most of them. Before I knew it, there were 75 pages left and I realized everything has been building up for a magnificent and glorious ending in book 3. And for that, I'm glad. This book built and built, plots were hatched, major people were killed, revenge was enacted, people were reunited and betrayed. Good guys were bad, bad guys were good, much was pleasantly surprising and equally upsetting. This is a dark and violent world, with a lot of anti-heros, and it most reminds me of A Song of Ice and Fire (A Game of Thrones) and even though grimdark fans will love it, it also has major crossover appeal to readers who enjoy that book. It's not senselessly brutal or violent, it's expertly written, with a bit more than a touch of magic but not overpowering as in traditional epic fantasy, there is a decent size cast of characters but not needlessly huge with tons of minor characters which is distracting to me, and even if a reader doesn't enjoy all the characters POVs as I do, they are all unique and include an elderly magus, a teenage girl in an underworld guild called Rag, several mercenaries, a queen, her elite bodyguards, a middle age ex-warrior named Nobul Jacks, the 7 foot tall Regulus Gor,whose tribe of warriors fight with teeth and claws as well as swords, the Father of Killers and his sons River and Forest, and several others. The fact I can remember all of these characters without any notes is testament to the power of this story. There are only a few other books I have read that I connected so well with and remembered so much about the story and characters. If real estate and fishing are about "location location location" then fantasy is "characters characters characters" and The Shattered Crown does a stellar job. I can't recommend this book highly enough. If I have to recommend a fantasy series from the past two years, this is in the top 10. This series is objectively as good, if not better than ASoIaF and I actually prefer it. More action, less confusing, quicker pace, less minor characters, and less politicking. Basically, everything I like in that series minus the things I didn't. I could see the sword and sorcery influences as well as David Gemmell , one of my favorite authors. If you are looking for something new, try this series. Start with book 1, Herald of the Storm because this book builds on that story. Could not agree more and that's the point I was trying to get across in my review. I think a lot about why some books become a huge commercial success and others don't. The Steelhaven books have received a lot of critical acclaim but based on the number of Goodreads ratings they haven't reached the level of fandom I wish they would and objectively they should. I do what I can...Hopefully someone will put my review on Reddit and spread it around some. I hope book three comes soon!